We’ve revamped our Overview Report with new filters, absolute values as well as some visual updates. All numbers that lead to a corresponding report are now clickable. 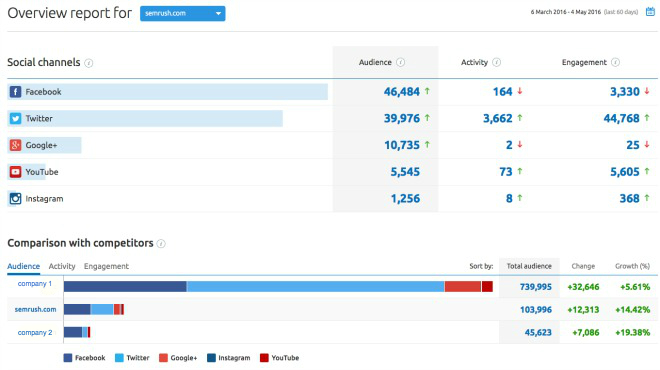 All changes in the Audience, Activity and Engagement reports are now presented using numerals instead of percentages, giving you a better picture of the social media landscape and allowing you to draw more precise conclusions. Numbers are now displayed in a bolder, larger font, and stacked one under the other, which makes it easier to compare them. You can switch between the results for each competitor in the Overview report via the Comparison graph. Simply click on the company’s name. The tool’s sorting options have been simplified to a one-click action. Click on the column’s name to enable sorting by such metrics as Total Audience, Change or Growth percentage for Audience, Activity and Engagement reports. We hope this update improves your overall experience with the Social Media tool. If you have any questions, comments or suggestions, send them to [email protected].